Ik vind die van Zara denk ik net een tikkeltje leuker! Haha, goed voor de credit card! I love this kind of post! Well done baby! Haha sterk blijven! Ik heb het er ook heel moeilijk mee want ik ben een echt shoe addict. Hoewel ik gek ben op de schoenen van Giuseppe Zanotti vind ik deze van Zara net iets mooier! Great picks! I love the detailing on the Zara ones! Ik vind die van Zara zelfs mooier! Jammer dat ze niet in 42 zijn. the low cost version is amazing! You have a good eye. The luxury pair I think has a slightly more elegant design but the other is just as nice really and looks slightly more walkable. Die van Zara vind ik het mooist! Those from zara are on my wishlist!!! Hele mooie vergelijking! Ik vind die van Guiseppe net iets mooier! 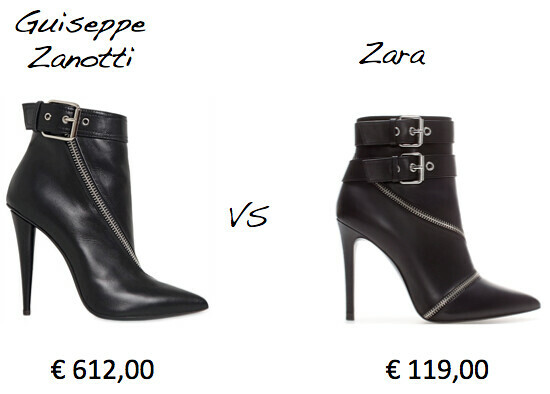 Love both but the one from Zara is more my style ;) great post! oh wow! awesome substitute <3 the Zara one looks just as fabulous! Ah! I wanna own them too! Ah well, I'm always for good and cheaper alternatives, the Zara heels are killing it! The Zara boots are a great alternative! Plus, I absolutely love Zara so much, never fails! Yeah well. I hadn't noticed the similarity before. The Zara ones look amazing, but.. It's always better to have the real deal right? Wish I could save up enough money and get them!